Keep files and projects close at hand with our Multi-Purpose Bins. Perfectly sized to hold letter-size interior file folders, you can also use them to organize binders, notebooks and magazines. Multi-Purpose Bins is rated 4.9 out of 5 by 400. Rated 5 out of 5 by Blondshell1 from Multi purpose bins I absolutely love these, as I haven’t got a walk-in pantry. My cabinets are very deep and were very difficult to organize my canned goods. These were perfect! Rated 5 out of 5 by Decor8 from Wonderfully Useful I use these incredibly useful bins everywhere! They are currently being used inside my file cabinet to hold bulky items, under the kitchen sink, and on a shelf to hold binders and magazines! They are sturdy, practical and inexpensive. I would recommend them to anyone. You will find so many uses for them. Rated 5 out of 5 by curatedspaces from So verstatile These bins are incredible for anywhere in the house. I've used them in my pantry- to corral the chip bags, baking goods, bags of nuts etc.. I like that they are clear so you can see the contents but good to label them as well. I am going to buy more for my freezer. Rated 5 out of 5 by Kate44 from Works for so many different things! I’ve purchased these bins for two different purposes already: 1) for marketing materials in an office setting (which works so great!) and 2) for my pantry at home. I love using them to organize both spaces! Rated 5 out of 5 by TexOkie from Inexpensive Pantry Organization I walked into my local store with the intentions of buying another more expensive container system but I saw these were I sale for a fraction of the costs. They fit my pantry perfectly and even better I can see through the containers for identification of products. The larger container is great for large bags of chips. Rated 5 out of 5 by HBscrapper from Awesome bins These bins can be used for so many different things. They are perfect for cleaning supplies under the sink and ziplocks, foil, plastic wrap. I also use the small ones for 8 1/2 x 11 scrapbook paper. The price is so affordable too so I didn’t feel bad about buying a bunch of them. Rated 5 out of 5 by vgl1 from Great for pantry organization I used the medium and large containers to organize canned and packaged goods in my pantry. Allows me to use vertical space without things falling over and I’m able to pull a container out by the handle without disturbing anything else. Great purchase! Rated 5 out of 5 by LaurenLikes2Cook from Great for upright freezer I purchased these bins in all 4 sizes to organize our basement upright freezer. They are tall and deep, which was perfect for corralling all of our convenience meals, waffles, fruits/veggies, and homemade leftovers. I would recommend these for any kind of standing freezer. I may also use them for our main pull out freezer, but I do not know yet how they will work. Rated 5 out of 5 by Sara05 from Favorite storage bin I have used these for many projects. They are sturdy, durable and easy to clean. Love this size for larger like things. Rated 5 out of 5 by CaseC from Perfect for every space! I have used these bins all over the house... under the bathroom sink, in the laundry room and also the deep freeze! Extremely happy with the durability of these bins and how versatile they are! Rated 5 out of 5 by rel83 from Every closet needs these! These bins got my pantry in order! I can find things easily by category. Used every size in almost all closets around the house. Awesome bins! Rated 5 out of 5 by 55337 from Multiply Uses and Easy to See Items I can not say enough about the Multi-Purpose Bins. I have them in my Craft Room, my Office, Under the my Sinks and even in my pantry! They are very durable and I love all the different sizes that they come in. Rated 5 out of 5 by Woodley from Kitchen organizing Baking and roasting racks were hard to store. A file-size bin solved the problem. Rated 5 out of 5 by lmtslc from Best Purchase Ever I used these for under my kitchen and bathroom sinks. They were exactly what I needed! I bought a couple of all the sizes so I could make sure they fit. I had a couple extras so I used them on some of my shelves too. I like that they are clear and the handles on them make it easy to pull them out. I will definitely be buying more. Rated 5 out of 5 by analyticshopper from Why didn't I buy these sooner? I purchased the large and medium bins to use under sinks. This little piece of plastic has been life changing for me. The bins just slide out and I have TIDY access to everything. I line up cleansers in some, and have hair products in one. It's so nice to corral all the messy looking bottles and so nice to not fumble with all the stuff under there when you want just one item. Rated 5 out of 5 by Mschoelkopf from Freezer bins! I bought these to finish my freezer organization. This is the only company that had real bins with the right depth to fill the freezer and with the different sizes I was able to utilize all the space in the freezer. Hubby isnt quite on board but i love having all the foods separated by category. Great product thus far! Rated 5 out of 5 by Jannarama from GREAT for Cardmaking/Scrapbooking supplies I have several of the Large sized Multi-Purpose Bins for my craft supplies. I store in a zipper type clear bag, thin metal dies, embossing folders, rubber and clear stamps, and even 8.5 x 11" cardstock. Two of these large sized Multi-purpose bins sit nicely side by side in the open-cube style bookcases. The built in handle on either end works very well for pulling out the bin from a shelf, and these containers are translucent enough that I can see what's in each container. Rated 5 out of 5 by BBan from Great for organizing These are perfect for organizing different catalogs, etc I had stacked on an office shelf. Perfect sizes and easy to view what is in them. Rated 5 out of 5 by Acmi from Perfect size and functionality Bought three sizes of these bins. They fit each space I'd plan for them perfectly. I love that you can store things vertically. They are durable, clear, but also have just a little flex to them. Can't wait to buy more! Rated 5 out of 5 by Vilmabkny from Perfect size! Perfect size bin for cleaning products; school supplies and many other items!!! 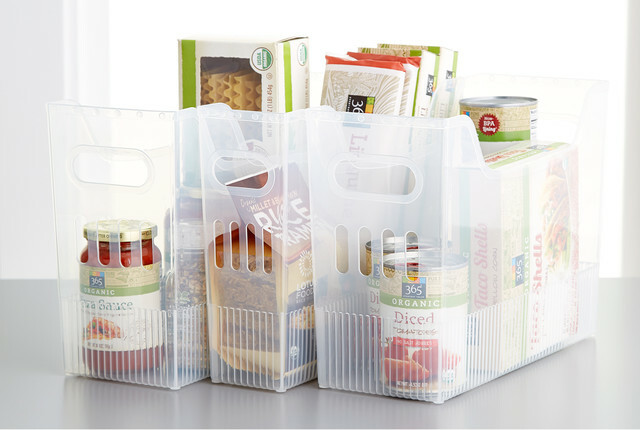 Rated 5 out of 5 by Sdubgold from The most utilitarian organizer I am absolutely obsessed with these bins. I’ve been using them for years and they come in handy in every room of my house. I use them in my closet for accessories, in the kitchen pantry, under the bathroom sink, for crafting supplies, and in the linen closet. They are incredibly durable, I’ve never had one crack or break. These are my go to for everything, can’t recommend enough. 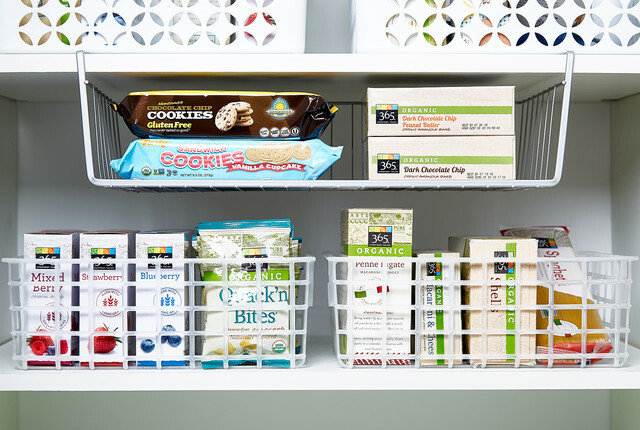 Rated 5 out of 5 by Indy54321 from Great Pantry Organizer I bought these to segment out my gluten free baking supplies and snacks, but when I realized how helpful it was to be able to pull a bin of similar items right off the shelf, I bought them for the whole pantry. In the process I ended up with lots more pantry space. Love that they come in several sizes! Rated 5 out of 5 by SassyShopper27 from Love them I use 3 different sizes to organize our BJU press homeschool stuff. They work great for that and many other things. Plan to buy more. Rated 5 out of 5 by DesertLiving from Perfect for the car The XL bin fit perfectly behind my Rav's car seats. The multiple handle holes are such a plus. The height and width is perfect to hold a lot of items. Being clear helps me remember what I put in there. The price was excellent for what I wanted to do with this bin. Rated 5 out of 5 by Designer31 from Perfect Size Bins! I bought several these bins during the 25% Kitchen Pantry Sale to organize my pantry and they are perfect!!! They hold all my pantry items perfectly! I like that they are clear, so you can see what what is inside them, also having a cut out handles makes it easy to pull them out to access my pantry items!! Rated 5 out of 5 by Char2 from So easy to organize with these! I saw how good pantries could look with these different sized bins. It looks and feels more organized. Every bin has its own category and things now have a defined place. Very affordable. Rated 5 out of 5 by tinakins from Love them I purchased these for my pantry in multiple sizes. Love them. Can see everything and my pantry now it looks organized. 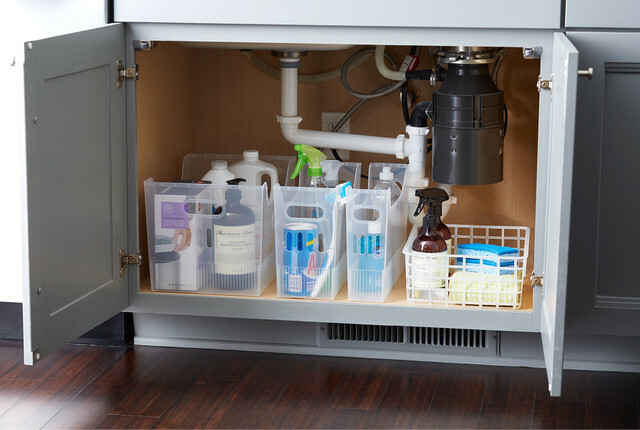 Rated 5 out of 5 by SimplerIsBetter from Simple Pantry and Under-Sink Storage Solutions These bins aren't fancy, but they have a few great features that make them ideal for organizing pantry and cleaning products without breaking the bank. They are made of harder plastic but not completely inflexible, so they can handle the weight of heavier pantry items. The handles make it easy to slide the bins in and out of your shelves to access items within, even if you have a ribbed pastic shelf liner. The clear plastic lets you see what is inside, while the high sides keep everything neatly aligned. I highly recommend the small bins to organize shelf-stable bottles in the cabinet. No more sliding bottles around to get to ones further back and worrying about knocking bottles over in the process and no more sticky spots on the shelf liners. I organize mine by type to make it easier to remember what is where (Ex. soy sauce, sesame oil, sriracha, and rice vinegar in a bin). You can get 3-4 bottles in each small bin depending on the bottles. I use the medium bins to store cleaning products under the sink, and the extra-large bins for dish towels and plastic wrap/foil/storage bags. How much weight will the multi purpose bin support? Would like to stack/store can goods and other items in my pantry. Do not want it to be too flimsy. I have filled mine with canned goods, bags of flour and sugar and have had no problems. Do these bins fit into a letter-sized file cabinet? I'm looking for a sturdy container that will fit into a file cabinet comfortably and hold either supplies or a large quantity of documents. BOX HANGING FOLDERS are made of paper and are vulnerable to tearing and collapsing, and have open sides so they will not work. Thank you. Yes, but only the small-large do and not the extra large bins. I use them for my office. Can these be attached to a wall? I have attached some of mine to the pantry wall simply using Command strips. I don&rsquo;t use them to store very heavy things (paper plates, etc). They have held up for years. You could always do a more permanent install by drilling through, but I&rsquo;ve found this method very successful. Do these ship (or come from the store) flat, or are they already in a box shape? I am considering buying some to take back overseas, but am wondering how well they would pack in a suitcase. Thanks! Is the surface a smooth/glossy plastic or more of a rough/matte plastic texture? Are these large enough to fit albums? Yes. The XL one can hold three 12x12 albums and the albums I have, the spine has to go either on top or bottom of the container. What are the dimensions at the bottom of the bin versus the top? I tried to be really accurate with a fine metal ruler: Medium 4 3/16&quot; wide at the bottom, 5 6/16&quot; at the top. Large 6 1/8 wide at bottom, 6 3/4 at top. These are the exterior measurements. The top flexes a bit, so could be squished into a fraction smaller space. Width of the medium and large Multi-Purpose Bins? Medium: SKU#:&nbsp;10051557 (13&quot; x 5-1/2&quot; x 9-3/4&quot; h) Large: SKU#:&nbsp;10045153 (13&quot; x 6-3/4&quot; x 9-3/4&quot; h) Please what is the width of the medium and large sized bins? I'm guessing (eyeballing) it at 4 and 6 inches but I need the accurate measurement. Many thanks.